If my most recent works haven’t been clue enough, I’ve been doing a lot of writerly experimentation with point of view and perspective. Hence the Lyric 1st Person Present in Namesake, the “other woman” focal character in Brine and Bone, and my current WIP, which has a protagonist who my readers already hate. One of the side effects of this experimentation: it spills over into the rest of my life, including the books I read. Which brings me to a point I never expected: defending the seemingly indefensible. 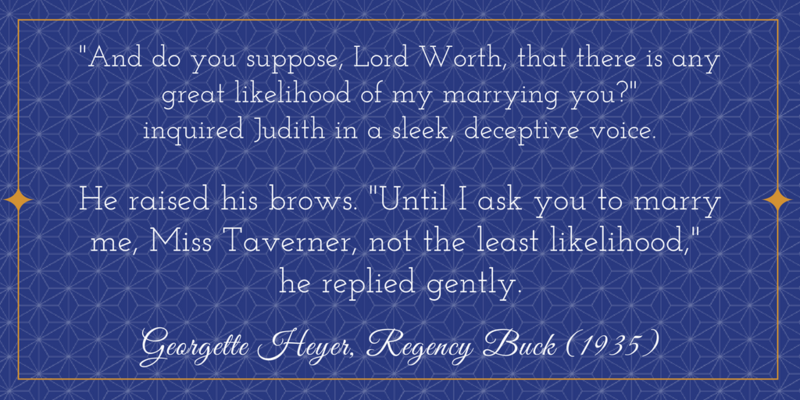 I recently re-read Georgette Heyer’s Regency Buck (1935). My purpose was for linguistic analysis rather than pleasure, but in the midst, that penchant for alternate points of view reared its head. At first glance, the hero of this novel, Julian St. John Audley, the Fifth Earl of Worth, is a controlling, manipulative jerk. Handsome, arrogant, wealthy, and high-handed as the summer’s day is long. But it’s okay because the heroine, Judith Taverner, is his equal in all these points. Awful people deserve each other, y’know? But the story is told from Judith’s perspective. Although we get scenes that center on Lord Worth, Heyer frames them in ambiguity rather than sympathy. Does he like Judith, or does he only like manipulating her? Is he secretly plotting to kill her brother? Does he want their fortune for his very own? They meet under adverse circumstances, and he behaves with enough rudeness to raise anyone’s hackles. If you’re sympathetic to Judith, that is. But what would the story look like from his perspective? The key to Worth’s behavior lies in his words at the end of the book: “Nonsensical child! I have been in love with you almost from the first moment of setting eyes on you” (Chapter XXIII). So this guy, barreling down a country road, almost plows into a shabby gig in the middle of a poorly-executed u-turn. He avoids the collision but, like anyone in such a situation, he’s annoyed. That was the worst possible spot to turn. The other driver must be a moron. The gig is blocking the road. Its passenger, as sharp-tongued as she is beautiful, says they don’t need his help, but he can’t drive on until they’re out of his way. So he doesn’t help. He has his servant do it. Which, all things considered, is a mercy. Judith and Perry’s pride is hurt, but it would’ve been worse if Worth had sat waiting for Perry to get his act together. Worth doesn’t even instigate any rude remarks. His great sin lies in preventing an accident, rendering help to the other party, and answering in sarcasm when spoken to ungraciously. I mean, I’ve been guilty of worse. So then there’s Meeting #2. When Worth pulls in beside Perry at the prizefight, it’s Perry who draws attention to himself by, again, failing to control his horse. Their exchange goes sour because of Perry’s reactionary nature. Worth makes some sarcastic remarks, but he never demands that Perry leave. Perry decides that on his own. The second meeting with Judith is more damning. Upon finding her on the side of the road, Worth picks her up, carries her to his curricle, and forces her to let him put her shoe back on. When she refuses to accept his offer to hit him, he kisses her in provocation. But he knows he’s crossing social boundaries. Why else would he encourage her to punch him in the face? What struck me in this reading: he treats her like an equal, not a damsel in distress. Yes, he teases, and he takes liberties, but he acknowledges his poor behavior and agrees to accept punishment for it. And really, is he supposed to leave her by herself on the roadside when fifty or more carriages might be traveling behind him? He’s coming from a prizefight. Hundreds of hot-blooded men are now dispersing into the countryside, and she’s out walking by herself because she couldn’t bother to bring along her maid. According to his end-of-the-book account, he’s already in love with her. He ain’t leaving her there for someone else to find. As for the kiss, she compares it to her father or her brother kissing her, so unless her family is gross beyond measure, it’s nothing more than an impertinent peck. But there’s a piper to pay. His comeuppance happens at the inn, when Judith and Perry reveal who they are and who their guardian is. And that’s the “Oh, crap” moment for Julian St. John Audley. It’s bad enough that he was mooning over a pretty country girl, but that pretty country girl turns out to be a wealthy heiress whose fortune he technically controls. Bad ton, Julian. Bad ton. From here on out, everything he does—and I mean everything—is for Judith’s benefit. He’s in love with her, and she’s determined to take London by storm. So he gets her a fashionable house. He provides her a chaperone who can introduce her into all the exclusive circles (which her cousin in Kensington had no clout to accomplish). He gives her a fast-pass into high society and supports her ambitions, and the whole time, everyone is ribbing him about bagging the heiress before she gets out of his control, and that mealy cousin of hers hangs around talking smack, and Judith herself determines to be obstinate even to the sacrifice of her own reputation and social success. And the further I read, the more I pitied this stupid, lovesick hero. The complaints against him? Yeah, because she point-blank says that if she thought there was a plot against Perry she “should be quite out of [her] mind with terror” (Chapter XIV). Essentially, he takes her at her word and keeps her in the dark to preserve her peace of mind. All the evidence he has against Bernard is circumstantial, and Judith likes the guy. What’s more, Bernard has sown enough discord that she might not believe any accusations Worth levels at him. He needs irrefutable proof and, more importantly, he needs Judith to see it firsthand. I’m charting this one to stress. When he finds her fainting in the Prince’s arms, he’s already taken his life in his hands by barging in on them. He then has to walk the tightrope of not offending the most powerful man in the country even though he’s itching to wring the guy’s royal neck. Also, at this point in the story, he believes that Judith hates his guts and that she acts against propriety to stick it to him. Plus, he’s just secretly kidnapped her brother to save him from yet another attempt on his life. Under the circumstances, I can forgive Lord Worth for being out of sorts. We all have our moments. In short, the instant I examined the story from his perspective, he became human and his faults shifted into focus. He has them, and I don’t mean to excuse them, but by and large, he’s acting for Judith and Perry’s interests, often against his own. Boiled down, they’re country rubes. They don’t know the first thing about London society. Much as they despise Julian St. John Audley, if he had left them to their own devices, they would have met with failure and, in Perry’s case, certain death. So I don’t dislike him anymore. On the contrary, I’d love to read a version of the book from his point of view, the poor sap.